and Abuse Claims lawyers in the collation and analysis of medical records. 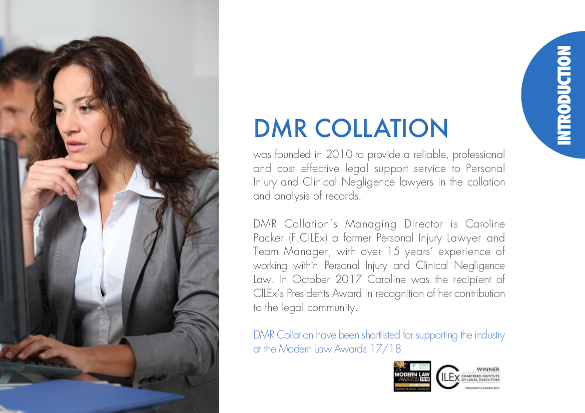 DMR Collation’s Managing Director is Caroline Packer (F.CILEx) a former Personal Injury Lawyer and Team Manager, with over 15 years’ experience of working within Personal Injury and Clinical Negligence Law. In October 2017 Caroline was the recipient of CILEx’s Presidents Award in recognition of her contribution to the legal community. Since 2010 Caroline and her team have continued to grow from strength to strength and in 2015 DMR Collation became a Limited Liability Company. At the Modern Law Awards in January 2018 DMR Collation were Highly Commended in the Category of Supporting the Industry (1-25 Employees). DMR Collation were listed as a finalist for the Practice Efficiency Award at the Legal & Cyber Security Awards in March 2018. DMR Collation pride themselves on the fact that they are consistently evolving to meet the needs and requirements of their clients. DMR Collation uses a unique blend of medical, legal and administrative personnel to deliver an exceptional standard of service to their clients. Caroline and her team know exactly what your requirements are because their staff have been in your shoes. @ARAG_UK @ClaimsMedia Well done @ARAG_UK ! Inquest Legal is a sole practice law firm and legal consultancy business. It was set up by experienced healthcare lawyer Peter Wade to provide a litigation support service to clinical negligence & personal injury law firms, and medico-legal training for healthcare organisations. Please see our Services page for details of our legal consultancy and litigation support for law firms – including assistance with witness statements, court & client attendance, case & medical records analysis, and training. Primarily however, Inquest Legal was established in order to provide an affordable legal option for bereaved families facing Coroner’s Court Inquest – following the death of a loved one – in a hospital, healthcare or mental health setting. The Brain Injury Group is a not-for-profit Community Interest Company that provides a complete package of support for brain injured people and their families. The Brain Injury Group was established in 2011 as a national network of dedicated brain injury lawyers and other specialist services to provide a gateway to information and advice for brain injured people, their families and carers. We have helped numerous individuals and families access legal, welfare and statutory funding help and many other services. Ever since our launch, we have remained committed to providing our clients with costs drafting and customer service of the highest order. Now, as our reputation grows, we are increasingly finding ourselves as the 'go to' firm for Civil and Commercial litigation drafting. Clients appreciate our pragmatic and 'real world' advice. We do not promise what we cannot deliver just to get your business. Ultimately, our continued success is down to our people - their commitment, high standards, and professionalism ensure that we always stand out from the rest. We are aggressive in the pursuit of your costs. We make no apology for that whatsoever. You have worked long hours to earn those costs. It is up to us to fight hard to ensure the recovery of the fullest amount. This is now more important than ever in the current climate. We do not employ account managers or business development teams. We don't need to. We have grown from word of mouth recommendations and we want to keep it that way! We are very proud to announce our collaboration with ARAG PLC. ARAG is a leading provider of legal insurance products, offering cover for all types of personal injury and contract cases. Their products cover own disbursements (including our pagination costs) and opponent's costs and are available for both personal and business customers. ARAG PLC have achieved a strong presence in the UK market since launching in 2006 winning ‘Insurance provider of the year’ at the Personal Injury awards in 2012 and growing year on year to today being a recognised symbol of quality within the insurance market. For more product information call ARAG on 0117 917 1680, email enquiries@arag.co.uk, or visit their website www.arag.co.uk. We are happy to be working in conjunction with Medbrief who offer a unique service providing the secure distribution and storage of medical records, radiology images and other confidential documents such as expert letters of instructions, medical reports, chronologies, memorandums and schedules of radiology used in personal injury and clinical negligence claims. This digital platform will substantially reduce your costs of copying, hosting, processing and distributing medical records. The platform also offers the ability to search for specific wording and to highlight entries of relevance making it a complete user friendly experience. The cost of the MedBrief platform is available on a reasonable fixed fee basis for a 24 month duration which provides complete certainty of disbursement costs at the start of a matter. Copyright DMR Collation 2018 Website by iMARVEL! Store digital records until claim concluded? Dispose of original unpaginated records? Records provided in disc rather than paper format? No. 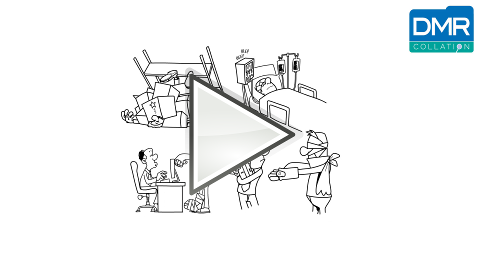 of medical record providers?